We’ve discussed many components of sleep and sleep disorders. A very common condition that many of you are walking around with undiagnosed is sleep apnea. Sleep apnea is a common, recurring sleeping disorder in which your breathing temporarily pauses during your sleep. Have you ever awakened and felt as if you were choking or coughing? We may be talking to you. The pauses of sleep apnea range in frequency and severity. They can last seconds or minutes. They may occur about 30 times in an hour. Let’s pause there. I just told you that many of you are suffering from a disorder in which you stop breathing while asleep. Think about what that means. Physiologically, if you’re not breathing while you’re asleep, your body will adjust. If you are in a stage of deep sleep, you’ll be kicked into light sleep, which is a lesser quality of sleep, and your body won’t be as replenished as it would otherwise. Your body will be less rested as a result, and you will suffer throughout the day. Sleep apnea is most commonly due to some level of obstruction—obstructive sleep apnea. Do you have a large tongue or big tonsils? Are you overweight? Are you a big snorer? We may be talking to you. That snoring may be the sound of air moving past some obstruction. By the way, obstructive sleep apnea occurs more often in overweight people, but it can occur in anyone. Now to the “So What?” of the conversation. This is about the quality of your life. Sleep apnea is about insufficient quantity and quality of sleep. It’s about excessive daytime sleepiness. It’s about recurring episodes of inadequate levels of air resulting from the breathing difficulty. These facts have consequences. 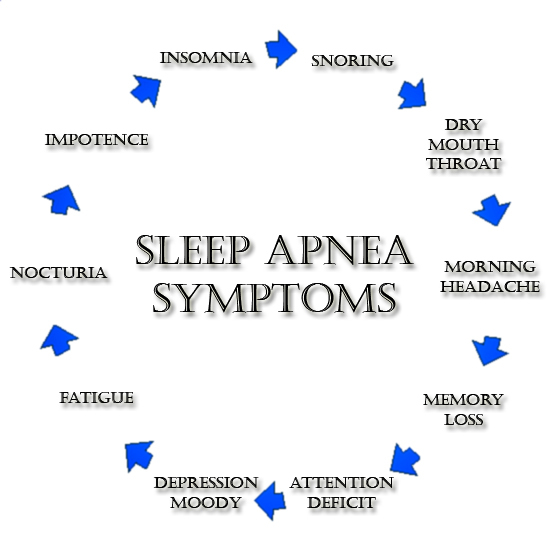 Refer to the lead picture above for an illustration of the various types of symptoms and problems that are associated with sleep apnea. Sleep apnea also brings risks for the following conditions and diseases if left untreated. Sleep apnea is easy and hard to diagnose at the same time. Many of you are suffering with it unsuspectingly as we speak. The person you sleep with may have expressed concern about your snoring or choking while you sleep. If so, get checked. Sleep apnea once diagnosed is treatable with some combination of lifestyle changes, breathing devices and mouthpieces. Surgery is used in some cases. We’ve reviewed many components of sleep and sleep disorders. Be mindful that sleep is your body’s time to rest and recover from the day’s activity. Any disruption in its ability to do that does not bode well for you over the long term. If your sleeping habits are problematic for you, you really should get evaluated. Getting this situation addressed can dramatically improve the quality of your life. Finally, review the attached video for an illustration of what’s happening during sleep apnea. Excuse the scary music! This discussion has focused on obstructive sleep apnea and not the less common form, central sleep apnea. The symptoms are similar, so if you have the other condition, it would be determined by your physician. Feel free to ask your SMA expert consultant any questions you may have on this topic. Order your copy of Dr. Sterling’s new book Behind The Curtain: A Peek at Life from within the ER at jeffreysterlingbooks.com, iTunes, Amazon, Barnes and Nobles and wherever books are sold. Thanks for liking and following Straight, No Chaser! This public service provides a sample of what http://www.SterlingMedicalAdvice.com (SMA) and 844-SMA-TALK offers. Please share our page with your friends on WordPress, like us on Facebook @ SterlingMedicalAdvice.com and follow us on Twitter at @asksterlingmd.